LEDV35-S-TS - AdMore Lighting Inc. Earn up to 595 Points. The AdMore Light Kit for the V35 side cases. Enhance your visibility! Make sure that you’re seen with this light kit installed in your V35 side cases! The AdMore LEDV35-S-TS Light Kit significantly increases your visibility on the road by providing brake light, tail light and red turn signal functionality to your V35 side cases. 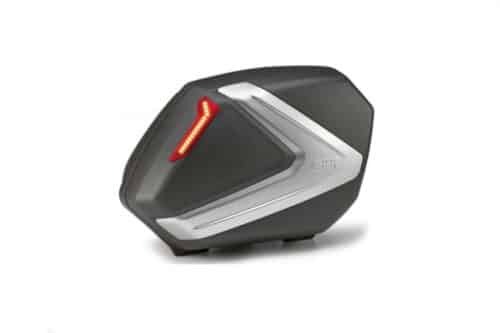 The LEDV35-S-TS light kit has been custom designed to fit the GIVI V35 side case. You will not ride unnoticed with this light kit installed in your V35 side cases! Easy install. Great way to add more visibilty! Also added black to white reflective tape (3m reflexite) to rear of bags. First, great product, well done! I received the lights for the v46 top case (stock Suzuki/givi) and it does fit the stock case. The installation for this case and the V-35 cases went well. The lights are awesome! Well, I’m heading out this morning for about 200 miles of QA for the GA Motorcycle Safety Program, lights on…. Thanks to your extremely helpful response last week. I just installed both the V35 & V46 kits today, and I am VERY happy with the way it worked out. Thanks for making such a great product! hi, my name is Bob S. and I have purchased your lighting kits from twisted throttle for my v-strom with givi 35 bags. the kit i bought several years ago was a great kit, good instructions and all worked well. due to no fault of your stuff (givi lid restraint failed in the wind out west this summer) I needed to put a new cannon plug set on my bags. the new 90 degree cannon plugs you sent me for the saddle bags are GREAT!!! i had made some foam blocks to cover the old straight style, but the new ones are nice. the lights add a level of safety on the back of the 1000 v-strom I really like. 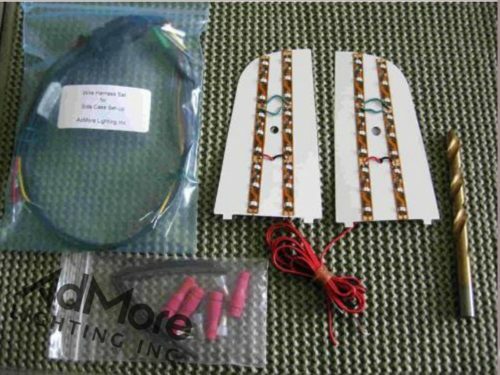 Thanks for all the great service in the past, I LOVE my Admore lighting kits! I can’t tell you what a difference your lights have made. I have them on my top case as well as my side cases and everybody who sees them (how can you not see them!) is impressed at the increased visibility of the bike. My wife loves them and feels much better knowing that I can’t be missed while I’m out riding or on my way to work. It’s the best money I’ve ever spent. Thanks again! I fitted the V35 side-case lights last spring and they’ve performed flawlessly since. I’ve had my side cases off and on MANY, many times and the quarter-turn connectors are so reliable and easy (I keep them greased with electrical-grease too). The fitting of the lights was easy on my Bandit 650. The required cables to tap into were easy to find on this bike. The only negative was the long rigid part of the internal connection inside the cases. 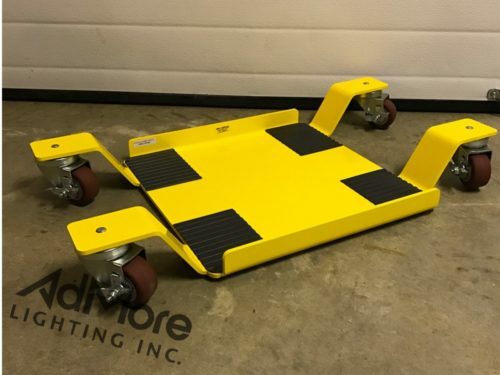 This was resolved BEAUTIFULLY by ordering Admore’s �90 degree� sockets instead – well recommended if you want to use maximum space inside the cases [AdMore comment: Now included with all new kits]. The other thing I’d like to comment on would be that I used adhesive cable restrainers to keep the internal case cable well and truly secured to the case inner-walls. It would be good to see such things included in the pack, they’re very cheap [AdMore comment: Now included with all new kits]. Thanks again for your great product and your advice on the alternative 90 degree connectors. Thank you for making a product that not only adds to the looks of my motorcycle, but also enhances the safety of commuting to work in the predawn. I have noticed that since adding the light kit to the V35 saddlebags that cars are not driving as close to me as they were prior to installing the kit. Having the combination running, brake, and turn signal lights on the outboard edge of the bags really makes the bike more noticeable in traffic. 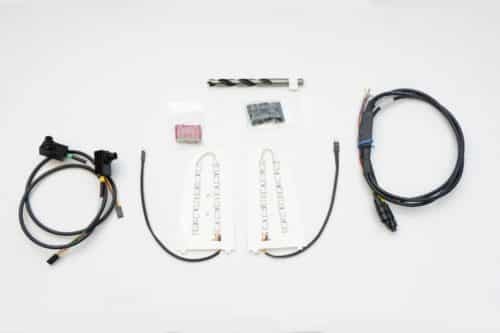 The installation went smoothly and the components are high quality with everything needed included in the kit. I have attached some pics of the bike and before and after pics of the lighting. Thanks Again. 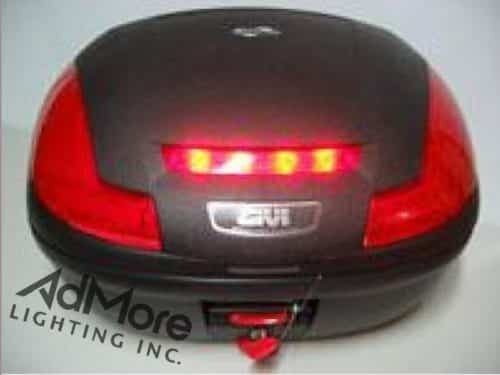 I love your light product that I purchased for my GIVI V35 luggage. Thank you!! As a safety conscious biker, I take a great interest in researching anything that may help to improve my visibility in traffic, especially to the motorists that seem to always fail to notice me! 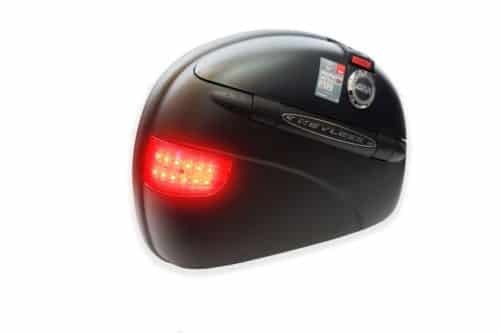 Luggage on a bike can sometimes distract the motorists eye away from the tail light, especially on GIVI kits were there are red lens with no reflective strip behind or lights fitted to them – the amount of motorists that watch these red lens expecting them to light when braking is phenomenal. This can lead to cars not reacting in time before impacting to your rear and is personally something I made a priority to rectify. During my research I came across Admore Lighting. Initially I was cautious due to them being so far from me, but having contacted them I received a friendly email reply from David. I found David to be a very pleasant guy who at no time forced me into any purchase, and who was more than happy to help with my research and put to rest any fears I had. He even went on to make a special offer deal for fellow Bandit riders on our forum, which was excellent. The systems Admore Lighting offers excellent LED lighting at eye level, which as stated in other testimonials could in turn become a life saver! Installation of the kit on my 2010 Suzuki Bandit GSF 1250 SA GT was very straightforward, and everything needed was supplied! The kit was dispatched promptly and arrived within the expected time period, I even had David email me to check it had arrived safely. Instructions supplied were detailed and concise, but extremely easy to follow. All connectors supplied allow for easy installation into the bike’s electrics. 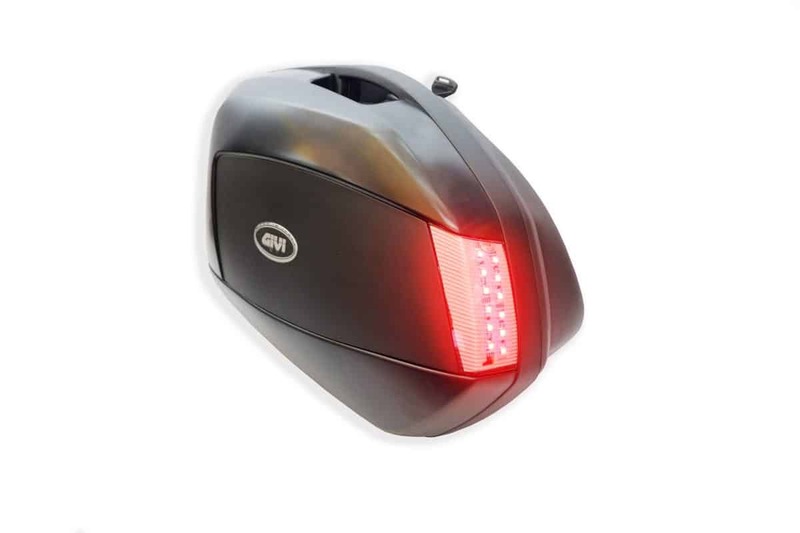 Due to UK laws, it was very easy to fit the kits and leave off the signal indicator, so as to give just brake light and tail light. To fit the V35 pannier kit and the V46 topbox kits took around 4 hours in total from opening the boxes. Once installed these kits just blend in as if they are designed to be there. A lot of time has clearly gone into designing these kits and they do attract a lot of attention from other bikers who are keen to replicate the effect on their own bikes. 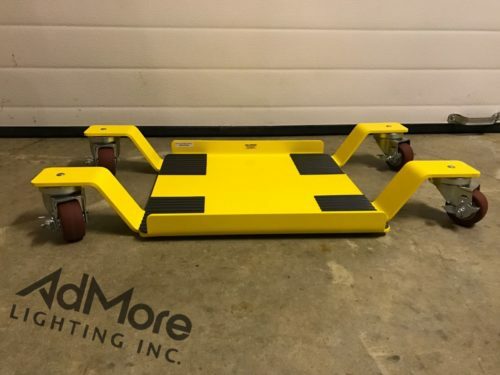 I can only recommend Admore Lighting for their products, components, lighting effect, safety improvements and most of all customer service and satisfaction. Would highly recommend! I purchased the Admore lights for my V-35’s and V-46 last autumn and finally got them installed last week. They are incredible! Also, easy straight-forward instructions. Thanks for a great product! I just installed a set of your lights on the Givi V-35 cases on a 650 V-Strom. The led’s were so small I wasn’t sure they would be bright enough. They work great!! It is unbelievable how well they work. Thanks!!! The AdMore kit [LEDV35-S] is exactly what I wanted: it’s easy to install, has quality components, provides full taillight, brake light, and turn signal functionality, and really makes a BIG difference in my bike’s visibility – both night and day. It’s money well spent both for great looks and additional safety! First of all, I would like to say thanks to you and Admore Lighting for asking me to take part in your V35 beta program . The package that you sent to me arrived in 2 days. The kit was well thought out, the instructions were well laid out and easy to follow. The wiring itself was very straight forward and very neat and tidy – the connectors made the job easy. I am more than satisfied with the outcome of this undertaking. I have had nothing but positive response on your lighting kits [LEDV35-S and LED52-T-TS] and will be recommending it highly on all of the motorcycling forums that I am currently a member of. This kit has improved the safety of my bike ten-fold. Thanks again for the opportunity and a great product.